Now, we have a drought on our hands that is epic. The USDA is predicting substantial food price increases in 2013 if not sooner (Food Navigator). 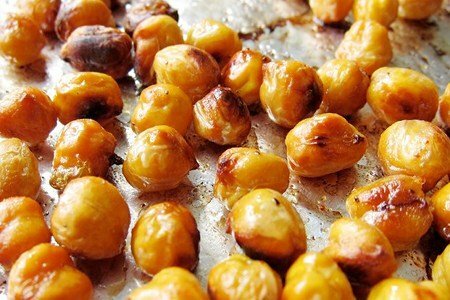 How do you stop the chickpeas from popping like popcorn in the oven? Wow, what great snacks! I love it! I tried these last weekend, sorry to say, my husband thought they were AWFUL ! Well, at least he tried them. I thought they were ok.
Apple slices with cookie dough dip! YUM!! Hmmm, I tried this recipe and must have done something wrong. A few were crispy but the rest were just cold, mushy garbanzo beans. But they looked like they were about to burn. Also, I didn't get much "flavor" from them. I hate wasting food so not sure if I'll try these again or not. Great idea though. I'm just a terrible cook. What kind of corn and peas can we eat. They said no sweet corn.